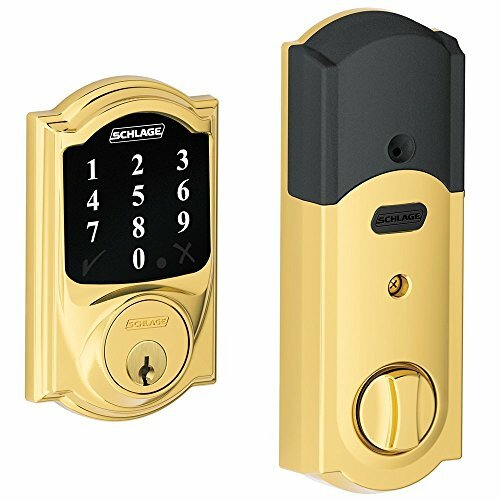 Schlage BE468-2KA Touchscreen Deadbolt is the newest version of the BE460 series and includes two matching keys instead of one. This model is compatible with many popular Z-wave systems such as Nexia, SmartThings, Wink, Lowe's Iris, Staples Connect, Alarm.com, 2gig, Vivint, Zipato, Vera, DSC, GE/Interlogix, Qolsys, ELK, Honeywell, and Leviton. The lock can be controlled by Amazon's Alexa when paired with a Z-wave controller compatible with Alexa. Inspired by modern architecture and design, the geometric shape and bold face blends beautifully with the contemporary decor of your home, while providing a seamless transition to the sleek Touchscreen keypad. This appearance is paired with the highest rated deadbolt for residential security, which can be controlled by a standard key, the Touchscreen keypad, or remotely by smartphone or computer through a Z-Wave compatible home automation or security system. All of these features are made for installation in a variety of standard door specifications and require no wiring, making this deadbolt the ideal choice for safety, design, convenience and functionality. With our innovative touchscreen feature, you have the convenience of going keyless and no longer having keys to lose, hide, carry or forget. The fingerprint-resistant touchscreen ensures numbers won't be detectable to intruders after repeated use-safeguarding your home even more. Durable Resistive Touchscreen - Fingerprint-resistant touchscreen protects against fingerprints and smudges and ensures wear patterns remain undetectable. Built from high quality materials, this keyless deadbolt gives you a high level of security at the main point of entry. Motorized Bolt - Tapered bolt design that automatically locks and unlocks when user code is input. Auto-lock Feature (disabled by default) - If the door is left unlocked the deadbolt will re-lock automatically after 30 seconds, as an added security measure. If you have any questions about this product by Smart home, contact us by completing and submitting the form below. If you are looking for a specif part number, please include it with your message.